No exposure limit has been set. Acetylacetone is a derivative of acetone; chemical formula: CH3COCH2COCH3; It is colorless to pale yellow transparent liquid. It is usually the mixture is enol form and keto form which are the tautomers of each other; these two forms are in dynamic equilibrium; enol isomer forms hydrogen bonds inside the molecule; in the mixture, the keto form accounts for about 18% and enol type accounted for 82%. Cool the petroleum ether of their mixture to-78 °C so the enol will be precipitated as a solid and the two forms will be separated with each other. Upon the enol form being returned back to room temperature, the above equilibrium will be restored. Acetylacetonate have a pleasant odor. It is flammable, and has a relative molecular mass of 100.13. Its relative density is 0.9721 (25 °C). Its melting point is-23.5 °C and boiling point is 140.5 °C or 139 °C (99.458 × 103Pa). Its flash point is 41 °C. The refractive index is 1.4494. It has a vapor pressure of 0.800 × 103Pa (20 °C). (At 20 °C 16.9,80 °C at 34) and is soluble in water, ethanol, benzene, chloroform, ether, acetone, ethyl acetate and acetic acid. It is susceptible to hydrolysis to generate acetic acid and acetone. The molecular structure of the acetylacetone is a saturated diketone structure in which two hydroxyl groups are connected by a methylene group; this form is usually referred to as β-diketone. Acetylacetone is also one of the simplest saturated β-diketones and is a derivative of acetone. It has an active chemical property and can react with ferric chloride aqueous solution to exhibit a dark red color. This product can almost react with the hydroxides, carbonates or acetates of all metals to form a complex with a general formula being (C5H7O2) • M, wherein M corresponds to the metal element and n is the metal compounds. Most of such compounds are stable, and many of them are soluble in many organic solvents. This product can have reaction with chlorine in the presence of light of with only two ends of methyl hydrogen being replaced by chlorine. When this product is reacted with sodium, it can release hydrogen and generates sodium acetylacetonate. Acetylacetonate have a narcotic effect and can stimulate the skin and mucous membranes; at high concentrations (100 × 10-6 or more), it is easy to produce some symptoms of poisoning such as nausea, headache, and dizziness. Rat oral LD50: 970mg/kg. Acetylacetone is an important intermediate for organic synthesis which is widely used in pharmaceutical, perfume, pesticides and other industries. Acetylacetone is an important raw material in the pharmaceutical industry, such as for the synthesis of 4,6-dimethyl-pyrimidine derivatives. It can also be used as the solvents for cellulose acetate, the drying agent for paints and varnishes, etc., and are also important analytical reagents. Due to the presence of enol, acetylacetone can form chelate with a variety of metals such as cobalt (II), Co (III), beryllium, aluminum, and chromium, iron (II), copper, nickel, palladium, zinc, indium, tin, zirconium, magnesium, manganese, scandium and thorium; it can also be used as fuel additives and lubricant additives. Taking advantage of its chelation reaction with many kinds of metals, it can be used as a kind of metal cleaning agent for micropore; It can also used as a catalyst, a resin cross-linking agent, the resin curing accelerator; resins, rubber additives; for the hydroxylation reaction, hydrogenation reaction, isomerized reaction, and the synthesis of low molecular weight unsaturated ketone as well as polymerization and copolymerization of low-carbon olefins; it can also be used as an organic solvent for dissolving cellulose acetate, ink, and paint; it can also used as paint drying agent; it can also be used as the raw materials for preparation of insecticide, fungicide materials, and animals laxatives as well as feed additives; it can also be used as infrared reflective glass, a transparent conductive film (indium salt), a superconducting thin film (indium salt) forming agent; acetylacetone metal complexes has special colors (green copper salts, iron red, purple chromium salt) and is insoluble in water; it can also be used as pharmaceutical raw materials and raw materials for organic synthesis. 1. ethyl acetate and acetone are condensed in the presence of a metallic sodium reaction; after the recovery of ethyl acetate, and the residue was neutralized with acetic acid, further add a solution of copper acetate which will form the green chelate precipitate of cooper acetylacetonate due to the chelation effect of acetylacetone; take out this precipitate and suspended it in diethyl ether, add diluted sulfuric acid for oscillation, after recycling the ether, the residue was separated by distillation to obtain crude acetylacetone, acetylacetone crude was subject to benzene (or ethanol) extraction refining to obtain the refined product. 2. acetyl chloride and acetone can react in an inert solvent in the presence of aluminum chloride to obtain acetylacetone. 3. ketene and acetone can be taken as raw materials and have reaction at 60~70 °C in the presence of sulfuric acid to obtain propylene acetic acid first, after purification, vaporize it at a high temperature (560~570 °C) to obtain acetylacetone after molecular rearrangement. During this process, the following balance may occur: to get more acetyl acetone, we should minimize the generation of enol as good as possible with a not very high temperature. After obtaining crude acetyl acetone, then vacuum distill for refining. 4. acetone was heated at 700 °C which can directly generate vinyl ketone; acetone is first converted to propylene alcohol; ketones ethylene reacts with propylene alcohol to obtain isopropenyl acetate which can be converted into acetyl acetone at 480~520 °C, then it is further subject to refining and rectification to obtain the fined product. The biggest advantage of this process is that it only needs one raw material-----acetone. Per 1 t product needs 2.55t of raw materials. This product is colorless or slightly yellow transparent liquid with an unpleasant odor, m.p.-23 °C, bp140.4 °C, n20D:1.4520, the relative density is 0.975, miscible with alcohol, ether, chloroform, acetone, acetic acid and some other organic solvents; it is also soluble in water; this product is flammable and corrosive. 1. Pentanedione, also known as acetyl acetone, is the intermediates of fungicides such as methyl mepanipyrim, mepanipyrim and herbicide pyrazosulfuron-methyl. 2. It can be used as the raw material of pharmaceutical and organic intermediates, as well as solvent. 3. It can be used as a analysis reagent and the aluminum extraction agent from tungsten, molybdenum. 4. Acetylacetone is a kind of intermediate of organic synthesis which produces amino-4,6-dimethyl-pyrimidine with guanidine; it is an important pharmaceutical raw materials. It can be used as the solvent for cellulose acetate, as gasoline and lubricant additives, as desiccants of paints and varnishes, and as fungicides as well as insecticides. Acetylacetone can also serve as a catalyst for cracking petroleum, hydrogenation and hydroformylation reactions as well as being the oxidation promoting agent of oxygen. It can be used to remove the metal oxides in porous solid and used for processing polypropylene. In the United States and Europe, it is used for the antidiarrheal medicine and livestock feed additives in more than 50% of cases. 5. In addition to having the typical properties of alcohols and ketones, it can also exhibit dark red color together with iron dichloride, and form chelate with many kinds of salts. It is produced from the condensation reaction between acetic anhydride or acetyl chloride and acetone, or from the reaction between acetone and diketene. It can be used as metal extraction agent for separation of three or tetravalent ions; it can also be used as paints and inks desiccant, pesticides, fungicides, and the solvent of polymer; moreover, it can also used as reagents for determination of thallium, iron, fluorine and be used as the intermediates for organic synthesis. 6. It can be as a transition metal chelator. It can be used for measuring the content of iron and fluorine with colorimetric determination, or used for measuring thallium in the presence of carbon disulfide. 7. It is the indicator for Fe (III) complex titration; it can be used for modifying the guanidine groups and amino-groups inside a protein. It can be produced by adopting different processing routes: reaction between acetone and diketene reaction or condensation between acetic anhydride and acetone or acetone-acetate ethyl condensation. 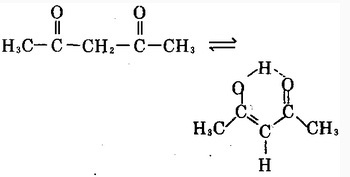 Acetone and diketene reaction is actually using acetone as raw materials, undergoing vinyl ketone, isopropenyl acetate, and then converting into acetylacetone; process is as below: introduce the pre-gasified acetone containing 1/1000 of carbon disulfide into the cracking furnace of 780-800°C, making it generate ketene (or using gasified acetic acid for cracking into ketone in furnace of 700 °C at the presence of triethyl phosphate as the catalyst and ammonia as the stabilizer), ketene is further absorbed by acetone and in the presence of sulfuric acid or acetyl sulfonyl, have it react at 61-71 °C with acetic acid to obtain isopropenyl acetate; after the fractionation for purification, the purity of isopropyl acetate propylene is over 93-95%. Then gasify the isopropenyl acetate, introduce it into the reformer preheated to 560-570 °C to obtain acetyl acetone through molecular rearrangement, condense, and fractionate for purifying the products. Every ton of product consumes about 2700kg of acetone. The condensation process of acetone and ethyl is carried out in the presence of sodium metal. Operation Example 1: add 120ml of refined ethyl acetate and 32 ml of ammonia into a cooling beaker. After the completion of addition of sodium amide, keep shaking the ice-water kept for 24h, have the mixture stand overnight at room temperature. In the following day, add 100g of ice, then join the same quantity of ice-water, for which the aqueous layer was made acidic by adding diluted sulfuric acid. Add saturated solution of copper acetate (produced by dissolving 40g of powdered copper acetate in a certain amount of hot water) to the above solution, so that copper acetylacetone is precipitated in the form of copper salts. If the reaction solution is alkaline, adding a small amount of acetic acid. After 2-3h, filtrate the gray acetylacetone and wash twice with water, directly transfer it into a separating funnel, add ether for constantly shaking while adding 50ml of 4N sulfuric acid to break down it. Take the ether solution for extraction of the acetylacetone within ether acid layer, combined the ether solution in two times, and dry with calcium chloride. The ether was evaporated off with the residue being continued for distillation, collecting the fraction within 125-140 °C and have it subject to refined distillation at 135-140 °C with the yield of 15-20 g and boiling point of 139 °C. Operation Example 2: to a 1500ml round-bottomed beaker, add 25g of sodium metal and 20 ml of diethyl ether, and further add 225 ml of cooled ethyl acetate with coolant. Add 73 mL of acetone upon cooling and stirring constantly, stand at room temperature for 4h, add 400ml of water, the water from the upper ethyl acetate, and the aqueous layer was neutralized with acetic acid, separate the acetylacetone at the upper layer of water layer while the water layer was neutralized by acetate solution, then add cooper acetate solution (dissolve 125 g copper acetate in 1500 mL of water) which will generates green acetylacetone chelate. After standing for 2-3h and the completion of precipitation filtrate it; suspend the precipitate in ether, oscillate with 50 mL of 40% diluted sulfuric acid; dry the ether layer with calcium chloride and evaporate out the diethyl ether; distill the oil-like residue, collecting the fraction in 124-140 °C, distillation again and collect the 139-140 °C fraction. The condensation reaction of acetic anhydride and acetone is catalyzed by boron trifluoride which has a relatively high yield. The refining method of acetylacetone: dissolve about 20 ml of acetylacetone crude product in 80ml of benzene, and then oscillate with an equal volume of distilled water for 3h. 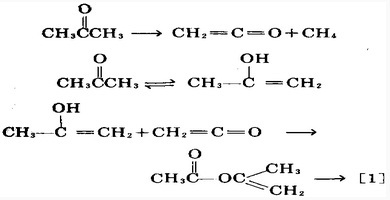 Water-soluble acid is assigned into the aqueous phase while acetylacetonate is easily soluble in benzene. The acetylacetone in benzene phase can be directly applied or subject to distilling off the benzene. Material consumption amount: acetone (industrial, water <0.5%) 2553kg/t, fuming sulfuric acid (H2SO4 count) 12kg/t, acetic anhydride (95%) 19kg/t, carbon disulfide (chemically pure) 6kg/t. The preparation method is using acetone for absorption of the acetyl-keto produced by the cleavage of acetate, in the presence of sulfuric acid or acetyl sulfonyl acetic acid, make it form isopropenyl acetate at 67~71 °C; after isolation and purification, obtain the acetyl acetone at 500~600 °C through molecular rearrangement and finally get the finished product through fractionation and purification. Acetylacetone (2,4-pentanedione) is a clear or slightly yellowish liquid with a putrid odour. It is readily soluble in water and in organic solvents and incompatible with light, ignition sources, excess heat, oxidising agents, strong reducing agents, and strong bases. On decomposition, acetylacetone releases hazardous products such as carbon monoxide, irritating and toxic fumes and gases, and carbon dioxide. Acetylacetone is used in the production of anti-corrosion agents and its peroxide compounds for the radical initiator application for polymerisation. It is used as a chemical intermediate for drugs (such as sulphamethazine, nicarbazine, vitamin B6, and vitamin K) and pesticides sulfonylurea herbicides and pesticides. It is used as an indicator for the complexometric titration of Fe (III), for the modification of guanidino groups and amino groups in proteins, and for the preparation of metal acetylacetonates for catalyst application. 2,4-Pentanedione is a colorless to yellowish liquid with a sour, rancid odor. The Odor Threshold is 0.01 ppm. Acetylacetone (2,4-pentanedione) is a clear or slightly yellowish liquid with a putrid odor. It is readily soluble in water. It is with other incompatible materials, light, ignition sources, excess heat, oxidizing agents, strong reducing agents, and strong bases. On decomposition, acetylacetone releases hazardous products, such as carbon monoxide, irritating and toxic fumes and gases, and carbon dioxide. Acetylacetone is used in the production of anticorrosion agents and its peroxide compounds for the radical initiator application for polymerization. It is used as a chemical intermediate for drugs (such as sulfamethazine, nicarbazine, vitamin B6, and vitamin K), sulfonylurea herbicides, and pesticides. It is used as a solvent for cellulose acetate, as an additive in gasoline and lubricant, as a dryer of paint and varnish. It is used as an indicator for the complexometric titration of Fe(III), for the modifi cation of guanidino groups and amino groups in proteins, and in the preparation of metal acetylacetonates for catalyst application. Forms organometallic complexes which are used as gasoline additives, lubricant additives, driers for varnishes and printer's inks, fungicides, insecticides, colors. Acetyl acetone is used as a reagent fororganic synthesis and as a transition metalchelating agent. Its organometallic complexes are used as additives for gasoline andlubricants, and in varnishes, color, ink, andfungicides. ChEBI: A beta-diketone that is pentane in which the hydrogens at positions 2 and 4 are replaced by oxo groups. Ketones, such as 2,4-Pentanedione, are reactive with many acids and bases liberating heat and flammable gases (e.g., H2). The amount of heat may be sufficient to start a fire in the unreacted portion of the ketone. Ketones react with reducing agents such as hydrides, alkali metals, and nitrides to produce flammable gas (H2) and heat. Ketones are incompatible with isocyanates, aldehydes, cyanides, peroxides, and anhydrides. They react violently with aldehydes, HNO3, HNO3 + H2O2, and HClO4. May dissolve plastics [USCG, 1999]. Inhalation causes dizziness, headache, nausea, vomiting and loss of consciousness. Contact with liquid irritates eyes. Exposures to acetyl acetone cause eye irritation, chemical conjunctivitis, corneal damage, and skin irritation (harmful if absorbed through the skin). At low concentrations for long periods, inhalation/dermal absorption of acetyl acetone causes irritation and dermatitis, cyanosis of the extremities, pulmonary edema, and a burning sensation in the chest. Ingestion/accidental ingestion in the workplace can result in gastrointestinal irritation, nausea, vomiting, diarrhea, and CNS depression. Inhalation of high concentrations may cause CNS effects characterized by nausea, headache, dizziness or suffocation, unconsciousness, and coma. The target organ of acetyl acetone poisoning has been identifi ed as the CNS. Exposure to the vapors of acetyl acetone cancause irritation of the eyes, mucous membrane, and skin. In rabbits 4.76 mg producedsevere eye irritation; the effect on skin wasmild. Other than these, the health hazardsfrom this compound have not been reported.However, based on its structure and the factthat it has two reactive carbonyl groups inthe molecule, this compound should exhibitlow to moderate toxicity at high concentrations, which should be greater than that ofthe C5-monoketones. There is no report on its carcinogenicity inanimals or humans. Behavior in Fire: Vapor is heavier than air and may travel to a source of ignition and flash back. Poison by ingestion and intraperitoneal routes. Moderately toxic by inhalation. A skin and severe eye irritant. Experimental reproductive effects. Mutation data reported. Flammable liquid when exposed to heat or flame. Incompatible with oxidning materials. To fight fire, use alcohol foam, CO2, dry chemical. Acetylacetone should be stored away from heat, sparks, flame, and from sources of ignition. It should be stored in a tightly sealed container, in a cool, dry, well-ventilated area, away from incompatible substances. Vapors may form explosive mixture with air. Incompatible with oxidizers (chlorates, nitrates, peroxides, permanganates, perchlorates, chlorine, bromine, fluorine, etc. ); contact may cause fires or explosions. Keep away from alkaline materials, strong bases, strong acids, oxoacids, epoxides. reducing agents; halogens, aliphatic amines; alkanolamines, organic acids; isocyanates. Strong light may cause polymerization. Occupational workers should only use/handle acetyl acetone in a well-ventilated area, with spark-proof tools and explosion-proof equipment. Workers should not cut, weld, braze, solder, drill, grind, pressurize, or expose empty containers to heat, sparks, or flames. 123-54-6 US $1.00 / kg 1kg High quality purified manufacturer Top 3 production capacity Factory Chemwill Asia Co.,Ltd.